In all honesty, my experience with bobbing for apples is based on the Peanuts’ It’s The Great Pumpkin, Charlie Brown! Halloween special. In my world, you have to dunk your entire head in to get an apple out. The history of bobbing for this magical, mysterious fruit with your mouth dates back to the Roman invasion of Britain, as the conquering army merged their traditions with Celtic festivals. Apples were a good omen, representing Pomona, the goddess of plenty, so why not search her out? 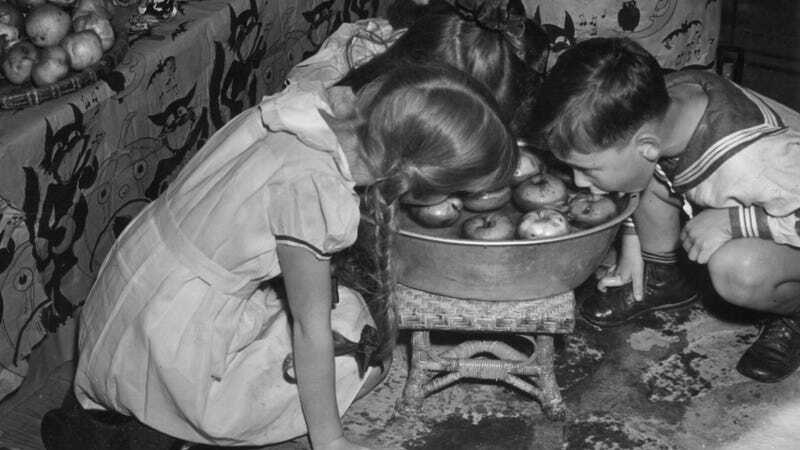 History.com points to the apple bobbing as subsequently involved in courting rituals, like having a female bobber attempting to bite into the apple assigned to her potential beau. “If it only took her one try, they were destined for romance. If she succeeded with her second attempt, he would court her but their love would fade. If it took three tries, their relationship was doomed.” The volume Halloween by Silver RavenWolf also describes the ritual of teenagers selecting each others’ apples from the bobbing bucket, but says that in the American version, the first person to grab an apple would be the first person wed. You could also throw an apple peel over your shoulder at bedtime to see what a future beloved’s first initial would be. A few years back, Munchies pointed to bobbing for apples as a female fertility ritual: “Goddesses, seeds, pentagrams, virgins, harvests, and juice—plop all of that together and lo, centuries of female-centric apple play is born.” Drawing on those British methods for predicting future love, witchcraft combines the pentagram of the apple as a fertility symbol with the searching for future husbandry, making the innocent party game of mid-century America seems a bit more sinister. Some parties hung the apples from a string and tried to get them that way. Magic-minded British women would also sleep with the bobbed apple under their pillow to predict their dream partner, or eat an apple while looking in a mirror: He was sure to pop up in the looking glass. So we got a deeper bowl, put our hands behind our back, and tried again: much, much more difficult. Should we have been using softer apples? Were apples smaller in olden times? We had a lot of theories, but surmise we lacked the skills of apple-bobbers of the past. At least we’ll always have the Great Pumpkin. For the rest of us: donut on a string, anyone?